Sales in 2012 remained stable for most language travel agencies in Switzerland and the outlook is optimistic, with anticipated growth in 2013, according to the latest survey from the Swiss Association of Language Travel Agents (SALTA), which regulates and standardises the quality of language trips and language stays abroad within the industry. Their annual 2012 survey of the Swiss market for language travel revealed increased interest in France, Malta, South America, and Italy as study destinations (see graph below). Agents reported a rise in French demand from 10.2% to 12.5% (from 8.1% up to 10.5% in France and a consistent 2% in French-speaking Switzerland). Meanwhile, German market share also rose from 6.8% to 10%. Language travel to English-speaking destinations still receives the highest demand, with the UK remaining the most popular destination with 21.5% market share. Overall though, interest in English language learning fell to 62.9% (compared to 67.8% in the previous year) with all major countries, particularly the US, taking a hit. Malta was the only English-speaking country to see a gain, moving from 4.1% to 5.3% growth, keeping it safely ahead of Ireland and New Zealand, and only just behind Canada. South America captured 1.1.% market growth, perhaps at the expense of Spain which saw a .5% dip, or perhaps due to an interest in Portuguese as well as Spanish. SALTA president Mark Winkler explained that trends are shifting towards shorter breaks, with 4 week courses becoming the preference as opposed to 5.7 weeks in 2011. This trend towards slightly shorter trips is expected to continue, especially as adults are combining their holidays with a two-week language course, for example. Due to career enhancement incentives, there is a growing interest in language stays abroad by adults over 50 years of age, especially in association with cultural activities. Language courses are also becoming more popular as part of company training (from 3.8% to 5.8%), but also for gap year experiences (from 8.4% to 12.3%). Furthermore, language travel organisers saw a growing number of online bookings. There are four national languages in Switzerland and according to the Federal Statistical Office, 63.7% of the population speaks German, 20.4% French, 6.5% Italian, and .5% Romansh. Speakers of Serbian/Croatian were the largest foreign language group, with 1.4% of the population, followed by English at 1%. Industry players in Switzerland suspect the dip in English demand may likely continue due to the strength of the English being taught in local schools. Traditionally, the first foreign language in school was always one of the other national languages, however, the move to promote primary school English came from Zurich’s head of education in the year 2000, as Switzerland began to adapt its education system to keep pace with globalisation and growing partnerships with other countries. 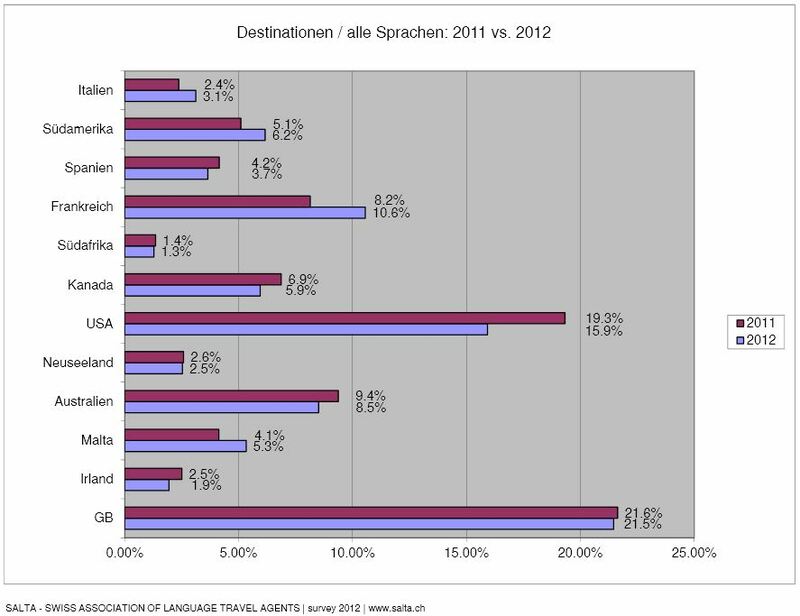 Interest in improving either French or German (depending on which canton a student is in) will naturally remain strong, as English becomes the second language taught in primary school but younger learners still need to study a second Swiss language as well. This international flare continues to be seen in the university sector as well, though is more focused on exchanges within the European Union. Each year, the ch Foundation prepares a quantitative analysis of school exchange activities. Compared with the figures for 2010/11, the statistics for 2011/12 reveal a significant increase in exchanges not only between the different language regions in Switzerland, but also with other European countries. The percentages of international students at Swiss doctoral/research universities and universities of applied sciences are among the highest in the world. Statistics from 2010 revealed that a total of 131,524 students were enrolled at universities in Switzerland; of these 27% were international students and 16% studied at the doctoral level. Approximately 17% of bachelor students were foreign, 30% of masters students, and as many as 49% of all doctoral candidates came from abroad. However, most of these international students come from other European countries, with Germany sending the lion’s share (10,000 students in 2011). More background on the Swiss education sector can be found on crus.ch or swissuniversity.ch which provides information for international students wanting to study in Switzerland and for universities seeking partnerships. This entry was posted in Agents, Europe, France, Germany, Higher Education, Italy, Language Learning, Malta, Regions, Research, South & Central America, Switzerland and tagged youth trends, student mobility, tertiary education overseas, language learning, backpackers marketing.